We pay tribute again to archivists and librarians who digitize their historical treasures. Pictures of these two paintings were found in the Ottoman Archives. The first painting is by German artist Johann Martin Bernatz (1802-1878) who traveled in the Holy Land in 1836. 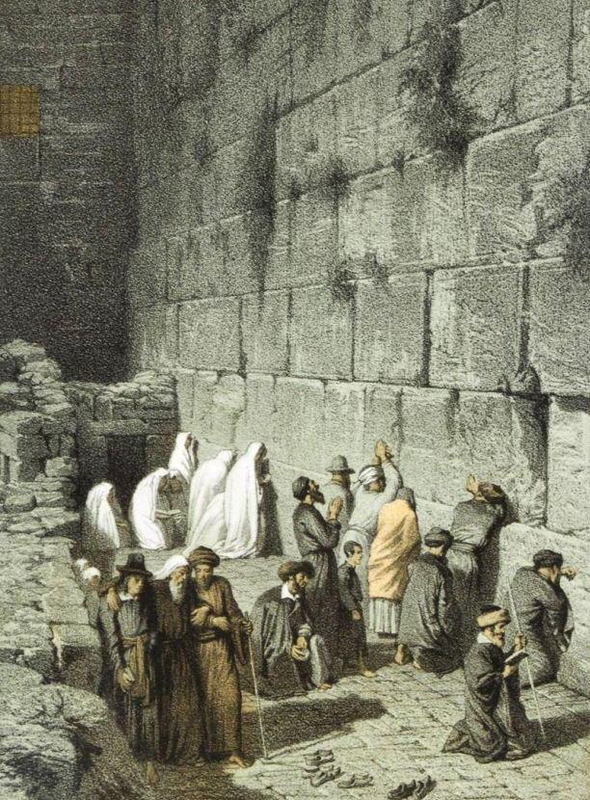 Jews Praying at the Wailing Wall by Johann Martin Bernatz. The Ottoman Archives provided a date of 1868. The second painting is by another German artist, Gustav Bauernfeind (1848-1904). Bauernfeind moved to Jerusalem in 1898. He is buried in the German Templar Cemetery in Jerusalem. 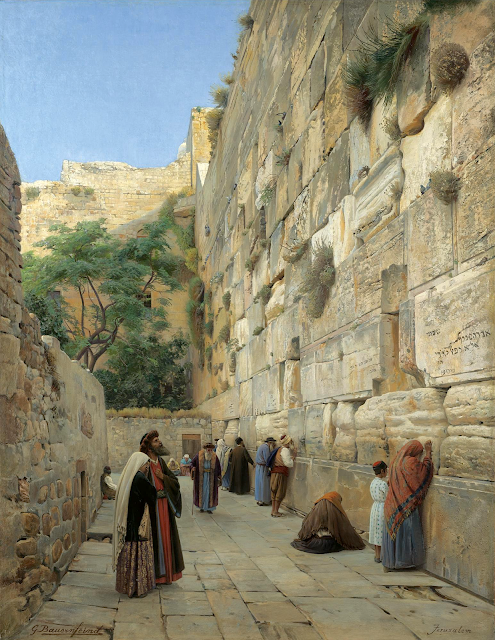 In 2007, his oil painting of the Wailing Wall sold for 4.5 million Euros at Sotheby. Hi, I reposted this on the facebookpage The Sephardic Diaspora. We have a nice discussion going on now about two points: the space before the wall is cramped in the images, while nowadays it is a vast open space. We solved that one. Another question is, why do we not see mehitzah's, when began the custom to put up a mehitzah? One suggestion is that it was connected to zionism. My own suggestion would be that it may be a difference in custom between Sephardim and Ashkenazim, as the images are dominated by Sephardim. While onserving differences between men and women they were, maybe, less bothered by it?